Alina Mirzoev holds a Diploma of Graduation from the Moscow State College in piano performance, teaching, chamber music and piano accompaniment. She was also taken a special course at the Gnessin Institute in Moscow. She studied with Professor N. Antonova and Dr. Zimina, herself a student of the legendary pianist Heinrich Neuhaus at the Moscow Conservatory. 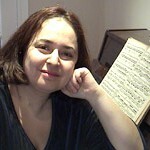 Currently, Ms. Mirzoev teaches piano at her private studio. Her students are the top prizewinners from numerous piano competitions and festivals and are the receivers of the highest theory examination marks.